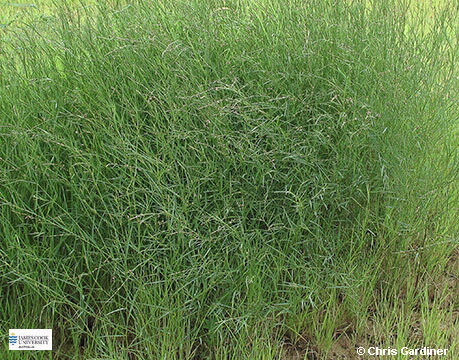 This slender, almost gras-like plant is erect and usually grows to about 70 cm. The narrow leaf is up to 7.5 cm long and 6 mm wide, stipules are prominent, papery up to 10 mm long. The pea-shaped flowers are borne in pairs and are well separated along the axis of the raceme. The pale pink standard is about 5mm long, wings are dark red and the keel is yellowish to orange. The pod is up to 15 mm long, and breaks up at maturity into 3-8 cyclindrical segments, in each there is a yellowish-green seed.